Kyle Waymouth (kylewaymouth.com) is a multi-instrumentalist and a premier Ottawa-Valley style step dancer. Kyle is a five-time Canadian Open Step Dance Champion, four-time Canadian Open Group Step Dancing Champion with his group Powerhouse, and a Canadian Open Clogging Champion. At age three, Kyle started step dancing at his mother’s dance studio, Judy’s School of Dance in Stratford, ON. He has since performed throughout North America and Europe. 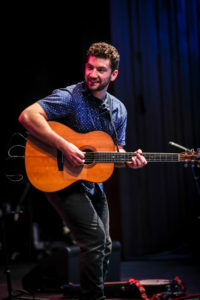 Kyle is a also a multi-instrumentalist, playing guitar, bass, mandolin, and fiddle. Kyle was recently an on-stage guitar player for the Stratford Festival production of As You Like It. He often tours with Canadian fiddle and stepdance family group, The Fitzgeralds. Currently, Kyle is teaching music and dance at Judy’s School of Dance and performing with numerous groups through Canada, US and Europe. Kyle was a great addition to AlgomaTrad 2018 and we are so pleased to welcome him back again this year!